Thanks be to thee, my Lord Jesus Christ, for all the benefits thou hast given me, for all the pains and insults thou hast borne for me. O most merciful redeemer, friend and brother, may I know thee more clearly, love thee more dearly and follow thee more nearly, day by day. Amen. Richard was the second son of Richard and Alice de Wyche, born in Droitwich about 1197. His father died young and the family was poor. When Richard went to Oxford, he and two student friends had only one cloak between them and had to take turns at attending lectures! He was soon noticed because of his ability and also his holiness. Edmund Rich, Archbishop of Canterbury, took him under his wing; he became a lifelong friend and role model. Richard went to Orleans to study theology and was ordained. On his return, he became Chancellor to the next Archbishop, Boniface. When the see of Chichester became vacant. 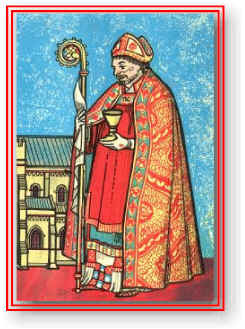 Boniface put Richard’s name forward and he was elected bishop. This angered the King, Henry III, who favoured another candidate. Richard appealed to the Pope, then in Lyons, and was consecrated by him. The furious King retaliated by depriving him of his house and living. He became a homeless beggar in his own diocese. Eventually Henry relented, but even when Richard was reinstated, he lived very frugally and gave most of his revenues to the poor. He was noted for improving the standards of the clergy in his diocese and the way the sacraments were celebrated; he encouraged the new Dominican Order in their work of preaching and he travelled about gaining support for a new Crusade to safeguard the Christian pilgrims to the Holy Land. In April 1253, he was in Dover to consecrate a church dedicated to St Edmund, his former Archbishop, but died of a fever the next day. His body was taken back to Chichester and buried in his cathedral. His shrine, behind the high altar, was destroyed and rifled at the time of the Reformation.